Posted on March 10, 2018 March 10, 2018 Tags 1970s, classic rock, Eddie Trunk, guitar, KISS, list, Music, top 20Leave a comment on KISS on My List! Posted on March 3, 2018 Leave a comment on Follow SonicRevelation on Twitter! Original Story: In Ovid’s Metamorphoses, a collection of poems focused on etiologies (or origins), we find the most popular retelling of the myth of Daedalus and Icarus. King Minos exiles Daedalus to the island of Crete and Daedalus plans to leave the island by taking the only path where Minos can’t stop him: the sky. He takes some feathers and arranges them so they mimic a bird’s wings and then binds them with wax (keep that detail in mind). As Daedalus and his son Icarus are preparing for flight, Daedalus gives a warning. Icarus is told that he should not fly too close to the water (drowning isn’t fun) and he should not get too close to the sun (getting scorched by the sun is also not fun). Basically, Icarus needs to fly the middle course and everything will be fine. Daedalus then kisses his son and Ovid’s writing hints that this is the last time Icarus will embrace his father. Daedalus takes flight and Icarus follows. They are seen by some fishermen who think the flying figures in the sky are gods (how’s that for a fishing story to tell your buddies?) and Icarus begins to fly higher. The wax on Icarus’ wings melts and he falls into the sea. In a heart wrenching ending, Daedalus turns around, shouts for his son, and finally locks eyes with the feathers that have fallen in the waves. 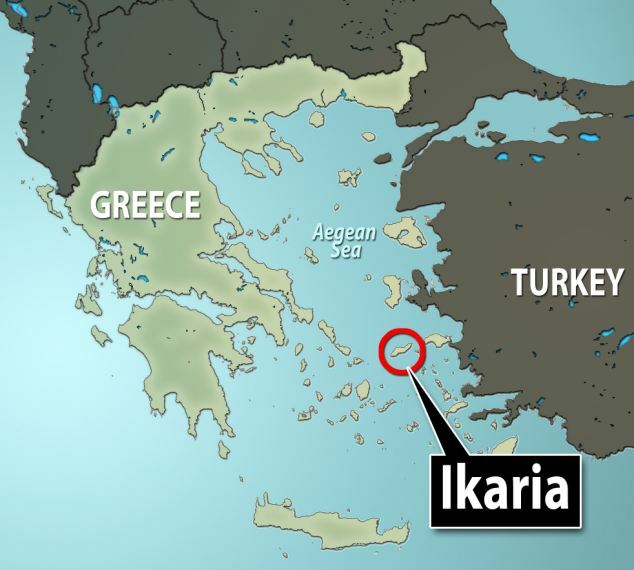 At the end of the story, we see the etiology (or origin) that Ovid explains: Daedalus buries the body of his son on an island that, from that point on, takes its name from Icarus: Icaria. At the bottom of this post, I’m including a link to the full text of the poem, since it’s a short read. It even includes the original Latin text to the English for you ambitious types. Iron Maiden’s Take: It’s not unusual for Iron Maiden to make historical or literary references in their songs, but one thing that is surprising about “Flight of Icarus” (from the 1983 album Piece of Mind) is that Steve Harris, bassist and primary songwriter for Iron Maiden, did not write this song. It was all Bruce Dickinson and Adrian Smith. In their portrayal, we don’t find the same tender relationship that Ovid shows. Daedalus is actually TELLING Icarus to fly closer to the sun. We see this in the opening of the song and the chorus: “As the sun breaks, above the ground /An old man stands on the hill… / His eyes are ablaze / See the madman in his gaze / Fly, on your way, like an eagle, / Fly as high as the sun.” This is a stark difference from Ovid’s portrayal of a caring father who tells his son to keep the middle course and leads the way off the island of Crete. In the second verse, Icarus declares, “In the name of God my father I fly” and then takes off. As the song continues, Icarus realizes that his dad isn’t a faithful father: “Now he knows his father betrayed / Now his wings turn to ashes to ashes his grave.” That’s the end of the story and the song closes with the chorus. As mentioned earlier, Iron Maiden isn’t afraid of including allusions in their songwriting, and in many cases, the lyrics are faithful to the original story. For instance, look at “Rime of the Ancient Mariner” from their 1984 release Powerslave. There are sections of lyrics that are taken verbatim from Samuel Coleridge’s poem of the same title. So what was the purpose of changing the story of Daedalus and Icarus? Maybe including a madman of a father fit more with the metal genre. It could be that having father and son working against each other just makes for a better story. Either way, all that matters is that the song is great, and if you haven’t heard it in awhile, scroll up to the top of the post and give it a listen. If you were alive on this day, you must have had a devastating existence up to this point. You would have lived without hearing Tom Hamilton’s hypnotizing bass line in “Sweet Emotion.” And you wouldn’t have even thought of humming Brad Whitford’s and Joe Perry’s bluesy guitar riff after hearing a friend tell you to “Walk this Way.” You would have lived without Aerosmith’s Toys in the Attic. Since this is Aerosmith’s third studio album, you (still working in the understanding that you’re hypothetically alive in the 1970s) would have at least had a chance to hear Aerosmith, even though their first album, the eponymous Aerosmith, achieved little commercial success. It is unimaginable today that an album with the Classic Rock staple, “Dream On” was once widely unknown. For their second album, Get Your Wings, Aerosmith brought in a new producer, Jack Douglas. He continued to produce their albums up until the 1979 album Night in the Ruts. Their second album was more successful than the first. Get Your Wings reached 74 on the Billboard charts in 1974, and when listening to this album in comparison to the first, one can tell that this album is closer to the signature Aerosmith sound known today. However, there was still room for Aerosmith to move up the charts and gain recognition. Commercially, their third album was more successful than their previous two. Toys in the Attic peaked at number 11 on the Billboard charts in ’75. They also had success with their singles, “Sweet Emotion” and “Walk this Way.” In the Billboard Hot 100, “Sweet Emotion” reached 36 in 1975, and “Walk This Way” reached #10 in 1977, giving the world two classic guitar riffs to hum when inspiration strikes. The album has grown in its success and influence since its initial release. It even led to their comeback in 1986 when Joe Perry and Steven Tyler collaborated with Run D.M.C in their cover of “Walk this Way.” According to the Recording Industry Association of America (RIAA), the album has since sold 8 million copies, making it an 8x Platinum record. Today, the album is available in many different mediums than were initially available. What are you waiting for? Go ahead and dust off your old record player, break out your classic CD player, or even look into more popular mediums like Spotify or an eight-track player.